Cinzina graduated with a BS in biology from Simmons College, Boston, MA, in May 2016. She was a student researcher at Simmons, studying diﬀerential decomposition rates of native Acer saccharum (Sugar Maple) and the invasive Acer platanoides (Norway Maple). She also studied how the arthropod community diversity responded to native acer litter in riparian habitats. After graduation she moved to Boise, ID, where she became a forestry technician for Nature's Capital. After that she became a student researcher with the University of Notre Dame Environmental Research Center where she designed her own research projects each summer, focusing on arthropod diversity each time. The following summer on the National Bison Range, she researched how dung beetle functional groups influence diversity of other arthropods. We are fortunate to have Hannah back scouting for us. As a fourth-season scout, her experience led us to give her our first year doing a pollination survey. She earned a Bachelor’s Degree in Environmental Science and Botany from Oregon State University in 2008. She returned to OSU in the fall of '09 to work for Drs. Denny Bruck and Jana Lee as a laboratory assistant, focusing primarily on Spotted Wing Drosophila. In addition, she is pursuing a Master's Degree in Entomology. She has two children and lives in Salem. Mariah graduated with a BS in Environmental Science at Portland State University March 2017, just before coming to work for us. Her background includes: being a habitat restoration and wildlife monitoring volunteer for Metro, creating native amphibian population surveys and identification of invasive species; being an Outdoor Science Educator at Tryon Creek State Park, and creating an outdoor science curriculum. Ellen graduated with a BA with a major in biology from Macalester College, Saint Paul, MN in 2014. She joined the AmeriCorps that fall coordinating invasive species surveys and designing educational materials and curriculums for school presentations. She moved to Oregon in 2015 and continued working with invasive species for the Clark Public Utilities (Vancouver, WA) and the East Multnomah Soil and Water Conservation District. She led volunteers in invasive surveys, treatment, and monitoring. She also conducted restoration fieldwork (planting, project site preparation and planning). is a graduate from the University of Hawaii where she earned a BS in Agroecology. This is her first season scouting for PCM. While in Hawaii, Amy worked on a 12-acre dragonfruit and mango farm Kealakekua Bay. She also has experience with permaculture design, which she used when developing a community garden at her university. has extensive experience as a lab technician and lab manager in several California and Washington laboratories. This is her first year scouting for PCM. She earned her bachelor's Degree in biology from Washington State University where she worked at the Vancouver Research and Extension Center. Debra also has years of experience as an 8th grade science teacher. is a first-year scout at PCM. He studied at Swansea University in the UK where he receives a master's degree in aquatic ecology and conservation and a bachelor's degree in Marine Biology. At Swansea University he investigated the presence of animal personality in the shore crab, carcinas maenas. Bryson also worked at an entomology lab at Ohio State University, identifying and reporting the range of expansion of indigenous and invasive insect species throughout Ohio. is another first-year scout at PCM. He earned a bachelor's degree in French, English, and philosophy from Western Michigan University. Justin grew up participating in his local 4-H club, which has given him years of farm-related and agricultural experience. has been a field scout for PCM for 4 years in the Salem area. A graduate from Oregon State University with a degree in Horticulture. He studied plant physiology, IPM, weed management, plant pathology, soils, and a number of other plant production electives. He has also worked in greenhouse pest management. is a first-year scout with PCM. Most recently, she was conducting research on a butterfly species for her master's degree work. She graduated from WSU-Vancouver in 2014. She has also led several surveys on plant-insect interactions. This is Claire's first year as a field technician with PCM. She brings horticultural and entomological expertise, having earned her master's degree in biosciences from the University of Minnesota, Duluth. Her work focused on plant and pollination issues. She has also worked as a Market Manager for a diversified vegetable and fruit farm in Duluth. has wide-ranging experience in the area of Environmental Sciences. This is his fourth season scouting for PCM. He is a 2006 graduate of Humbolt State University with a BS in Natural Resource Planning. He is kept busy in the winter season by his woodworking business. has been a field scout for PCM for 3 years. A graduate from Oregon State University with a degree in Horticulture. He studied plant physiology, IPM, weed management, plant pathology, soils, and a number of other plant production electives. He has also worked in greenhouse pest management. is a recent graduate from Oregon State University with a degree in Ecological Engineering. His background includes research on invertebrate biodiversity for green roofs, collecting data and reporting results. He has also had data collection and management experience as a forest lab and field assistant for USGS. Studied environmental Sciences at Humboldt State University. She has worked in nurseries with building a large and diverse knowledge base of plants, their pests and diseases, and their growing habits. She is a certified yoga teacher. has wide-ranging experience in the area of Environmental Sciences. This is his third season scouting for PCM. He is a 2006 graduate of Humboldt State University with a BS in Natural Resource Planning. He is kept busy in the winter season by his woodworking business. has been a field scout for PCM for 2 years. A graduate from Oregon State University with a degree in Horticulture. He studied plant physiology, IPM, weed management, plant pathology, soils, and a number of other plant production electives. He has also worked in greenhouse pest management. is a returning scout to PCM. She has a BS in Environmental Science and Botany from Oregon State University, and monitors fields throughout the Willamette Valley. She has also assisted USDA researchers on researching Drosophila suzukii. is the Projects Coordinator for PCM and began working in February 2013. This new position includes helping organize on-farm trial projects, working with the Oregon Strawberry Commission on fresh market production, and scouting field sites. Lora's Agricultural experience is diverse, having worked on several CSA farms, for the USDA-ARS in Corvallis, and with farmers in SE Idaho. She has a BA in Geography from Oregon State University and an MA in Environmental Science and Community from Humboldt State University. has wide-ranging experience in the area of Environmental Sciences. This is his second season scouting for PCM. He is a 2006 graduate of Humbolt State University with a BS in Natural Resource Planning. He is kept busy in the winter season by his woodworking business. is a recent graduate from Oregon State University with a degree in Horticulture. He studied plant physiology, IPM, weed management, plant pathology, soils, and number of production related electives. His background in greenhouse pest management and various volunteer and paid jobs are an excellent base for scouting. This is his first year with PCM and he is scouting fields in the Salem area. is a 2010 graduate of Sonoma State University with a bachelor's degree in Environmental Studies and Planning with a minor in Biology. During college she also studied entomology, genetics, and plant propogation. This is her second season scouting for PCM. has wide-ranging experience in the area of Environmental Sciences. He is a 2006 graduate of Humbolt State University with a BS in Natural Resource Planning. His past experience includes trail maintenance and hazardous tree ID, managing tree trimming crews, monitoring nests of burrowing owls, and counting elusive birds. is a 2010 graduate of Sonoma State University with a bachelor's degree in Environmental Studies and Planning with a minor in Biology. During college she also studied entomology, genetics, and plant propogation. has a BS in Wildlife Biology from Missouri State University. He lives in the the Salem area and will scout the Willamette Valley Fruit Grower and Pan American fields for the full array of pests and diseases. He will scout fields in the area for the Oregon state-funded Spotted Wing Drosophilia survey. completed her Master's degree at Marylhurst University and is certified as a high school science teacher. Previous to that, she graduated from Oregon State University with a BS in Botany and Plant Pathology. 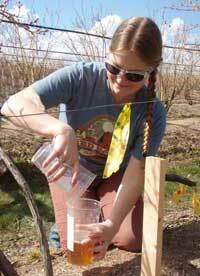 She scouted numerous growers' fields primarily for the Oregon state-funded Spotted Wing Drosophilia survey. In addition, she assisted Julie Pond in supervisory tasks and worked with Tom to created the weekly SWD reports. is a new scout for the 2011 season. He has a BS in Horticulture from Missouri State University. He was active in pest identification and controls in the campus greenhouses. He will be scouting the full range of insects and diseases for clients’ fields in the Southwest Washington area. is a new scout for the 2011 season. He has a BS in Environmental Sciences from Michigan State University where he focused on ecology, biology, entomology, chemistry and natural resource management. He was active in research projects and managed production of the student greenhouses. After graduation, he joined the Peace Corps was sent to West Africa where he spent two years working in agriculture with farmers and villagers. He will be scouting the full range of insects and diseases for clients’ fields in the Hillsboro area. was born into agriculture (both parents are in the nursery business) and has worked with plants all her adult life. She has a BS in Environmental Geography from the University of Oregon. Emmy scouted for pests and diseases in client growers' fields in southwest Washington, and also scouted fields in the area for the Washington Commissions'-funded Spotted Wing Drosophilia survey. has a BS in Environmental Geography from the University of Oregon. He was an independent researcher at the Eastern Oregon Agricultural Research Station. He scouted for pests and diseases in client growers' fields in southwest Washington, and also scouted fields in the area for the Washington Commissions'-funded Spotted Wing Drosophilia and the ODS SWD surveys. lives southwest of Salem and scouted client fields in the Linn/Benton county area, as well as some fields in the area for the Oregon state-funded Spotted Wing Drosophilia survey. He graduated from Missouri State University with a BS in Horticulture and has worked as an arborist as well as a scout. He has worked in vineyards and with landscaping. After leaving PCM at the end of the season, he obtained a job as a fieldman for one of the growers in the Salem area. has a BS in Plant Science from the University of Arizona, with a focus in botany and controlled environment agricuture. He was involved in a number of greenhouse research projects involving various rhizome species, variety trials, and closed system agriculture. 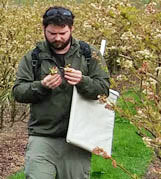 He scouted for pests and diseases for PCM clients in the Hillsboro area, and in various fields for the Oregon state-funded Spotted Wing Drosophilia survey . was the major scout for the Willamette Valley Fruit Company fields during 2009. She earned a Bachelor’s Degree in Environmental Science and Botany from Oregon State University in 2008. She returned to OSU in the fall of '09 to work for Drs. Denny Bruck and Jana Lee as a laboratory assistant, focusing primarily on Spotted Wing Drosophila. In addition, she is pursuing a Master's Degree in Entomology. was our Southwest Washington field scout for 2009, scouting strawberry and caneberry fields. She obtained a Bachelor's degree in Environmental Science from Hawaii Pacific University in 2008, with a focus on Plant Science, She left in the winter of 2009 for Peace Crops exerience in Zambia. came back to PCM during the winter of 08-09 to help with a research project, and stayed on for another season of scouting, this time in Hillsboro, Sauvie Island and SW Washington. She graduated in 2007 from the University of Oregon, with a Bachelor of Science in Environmental Studies and Geography, with a focus on Agriculture. With all the scouting experience she has under her belt she has become our ‘Master Scout’ this year. She began a two-year stint in the Peace Crops in September 2009, heading off to Senegal. was our Southwest Washington field scout technician during 2008. She earned a Bachelor’s Degree in Soil & Crop Science from Colorado State University in 2005, emphasizing her studies in Environmental Soil Science. With her passion for sustainable agriculture and past experience in field scouting, her keen eye was a great help throughout the scouting season. was the 2008 scout floater, meaning she scouted in every area, supplementing the regular scouting schedule. Sarah obtained a Bachelor's degree in Environmental Affairs from Lewis & Clark College in 2002 with a focus on Northwest Fruit Crop Production. In 2007, she took graduate level entomology course work at Oregon State University. She returned to OSU after the scouting season to continue her work in entomology. She recieved her Master's Degree in entomology in Spring 2010.
was the Willamette Valley Fruit Company scout for the 2008 season. She graduated in 2007 from the University of Oregon, with a Bachelor of Science in Environmental Studies and Geography, with a focus on Agriculture. She took a few months off before returning to PCM in December 2008 to work with Scout Supervisor Julie Pond on a Phytophthora project. She stayed on for the 2009 as a scout. is the Field Coordinator for Oregon Berry Packing, Inc. Farmer from birth, he has a wealth of experience with NW berry crops and assisted in scouting OBPI’s growers’ fields during the 2008 season.